WASHINGTON (CN) – President Donald Trump sent Congress a $4.1 trillion spending plan Tuesday that calls for fundamental changes to welfare programs and cuts to federal agencies while boosting defense and national security spending. 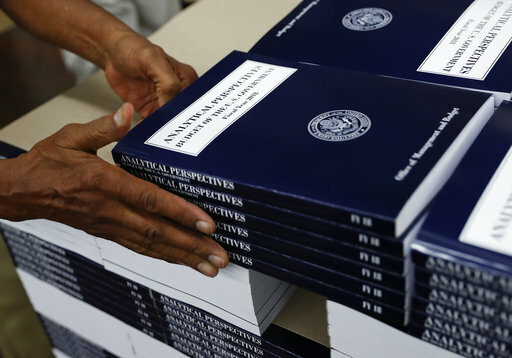 The budget, dubbed the “New Foundation for American Greatness,” balances after 10 years and expands on a short budget outline Trump released in March. Amidst the cuts to federal programs, the budget calls for $19 billion to establish the country’s first paid parental leave program. The budget assumes the Affordable Health Care Act that passed the House earlier this month becomes law and calls for more than $610 billion in cuts to Medicaid. Together, the repeal of the Affordable Care Act and cuts to Medicaid will save $800 billion over 10 years, according to the budget. The next largest source of savings in the budget come from reforms to welfare systems such as the Supplemental Nutrition Assistance Program (SNAP), sometimes referred to as food stamps. The budget calls for a requirement for the program that able-bodied people without dependent children work in order to receive the benefit. Office of Management and Budget Director Mick Mulvaney said the administration will also change the way states and the government share the costs of the program, arguing states are better positioned to direct the funds to where they are most needed. The administration calculates the changes to SNAP will save more than $193 billion over the ten-year life of the budget. Mulvaney said the changes happened in part because the number of people on the program has not come down since the recession as expected, causing him to speculate there are people on the program who should not be. Another deep cut comes from reforms to the federal student loan program. The changes would eliminate subsidized student loans and would have all students pay back their loans at a rate equal to a fixed percentage of their discretionary income. Combined, the changes to student loans would save $143 billion, according to tables in the budget. The budget also reforms the Earned Income Tax Credit and the Child Tax Credit by requiring that people who want to claim the credits provide their social security numbers, which Mulvaney cast as a way to cut down waste and prevent people in the country illegally from receiving credit. “People don’t mind paying their taxes as long as they know their money is not being wasted and for too long, I think the federal government has been unwilling to prove to them that that’s the case,” Mulvaney said. The cuts are necessary to offset increases to defense spending, including a proposal to eliminate the sequester and pumps $469 billion more into defense programs. Trump would also receive $1.6 billion for building and replacing sections of a wall along the southern border, a key point in his campaign for the White House. Changes to the spending authorities for federal agencies also follow Trump’s rhetoric during the campaign, as the budget balances boosts in defense and national security spending with deep cuts to agencies like the Environmental Protection Agency, which would receive 31 percent less under the proposal. The State Department would also face a 29 percent cut, while the Corporation for Public Broadcasting would over time lose all of its federal funding under the proposal. Congress will weigh in on the budget in coming months and is likely to change it significantly as with past administrations. Mulvaney said his team will deliver the budget to Congress on Tuesday and Mulvaney is scheduled to testify at two hearings during the week in the House and the Senate.